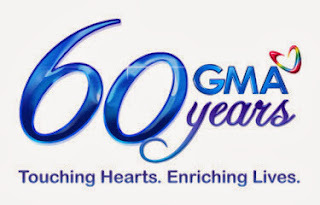 Telebabad: GMA's 60th Anniversary Network ID "TAGUMPAY NG KAPUSO"
GMA's 60th Anniversary Network ID "TAGUMPAY NG KAPUSO"
GMA-7's 60th anniversary network ID celebrates how far it has come in the last six decades and takes the opportunity to share this achievement with its audience. Titled "Tagumpay ng Kapuso," the ID showcases the men and women of GMA, and their efforts, on and off-camera, to deliver the Network's commitment to superior entertainment and the responsible delivery of news and information to its Filipino audience. GMA's 60th Anniversary Network ID was launched yesterday, May 30, on Party Pilipinas. Tagumpay's theme song was composed by Simon Peter Tan and sung by Are You the Next Big Star winners Frencheska Farr and Geoff Taylor with the Six Feet Long band.